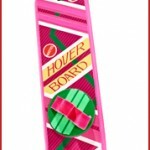 Over at the MattyCollector Forums, Toy Guru has posted some more info on the upcoming Back to the Future 2 Hoverboard. 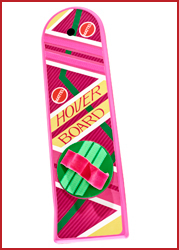 Wow, I have personally been waiting to get a BTTF2 Hoverboard ever since my first stop at the Café 80’s. As a lifelong BTTF fan, getting to this official prop replica from Mattel has been a dream come true. There have been a few top line questions about our amazing new prop replica, so I’d like to try and hit them all here. So what exactly does the Hoverboard do? The Board will do pretty much everything the “real” Hoverboard does in the movie – except actually Hover. It will be made of plastic and will house electronics, so as the board is “moved” (i.e., pushing it with your foot or kicking it across the floor) it will make all of the film accurate noises, including the “whoosh” and “buzzing” noises. All will be sampled directly from the original movie sound effects (provided by our amazing partners at Universal!). It will gently glide over most flat surfaces, but as hovering technology is not expected to be invented until 2015, it does not actually leave the ground. The sound effects are being added in a very amazing way. The speaker vibrates the sound through the plastic giving it that film accurate organic magic (and preventing us from adding film inaccurate sound holes! )It really is an amazing sensation causing sound and just the right amount of humming as it detects side to side as well as forward and backward momentum. Pick it up and it will detect this as the board instantly turns off just like Marty’s did! If you have seen our award winning Ghostbusters PKE meter or Ghost Trap prop replicas, you will know the quality to expect. We are putting a huge amount of work into this to ensure it is the most accurate it can be. We’ll even be meeting with several members of the BTTF production crew, including screenwriter Bob Gale and special effects supervisor Michael Lantieri, who will be bringing the original props to Mattel so we can review them and ensure our replica is as accurate as possible. While the Board is not designed to be a “ride on,” we are working to ensure it holds as much weight as possible as we know a lot of fans will want to stand on it. But it will not support weight to float around on across your floor (that technology simply hasn’t been invented yet! ), but it will be the exact same size as the one Marty McFly rode in the films. We know fans and customers are putting a lot of faith in Mattel by preordering an item you have not held or seen a working final model. But just know that your faith will be rewarded. By pre-ordering now you will guarantee the price of $120 and get an exclusive 6″ Hoverboard for use on most Mattel 6″ action figures. There will be a very small number of units available in the fall, but the price will be higher and it will not include the 6″ Hoverboard. If you are a BTTF fan, now is the time to pre-order as this will be the best was to guarantee you get what is sure to be one of the hottest toys of 2012! The pre-order is from March 1 through March 20 only – there will definitely not be a sale extension. And while you are visiting Mattycollector.com, be sure to check out our March sale on essentials to start or complete your action figure collection for a variety of brands, like Masters of the Universe Classics, Ghostbusters and Voltron. Again, this is an extremely limited time offer. Act now as the Hoverboard is being built to order. You may pre-order as many as you want, but once the pre-order closes, availability in the fall will be EXTREMELY limited. I highly suggest pre-ordering to guarantee your Hoverboard at the pre-order price, as well as get the exclusive 6″ board for your action figures or desk display!